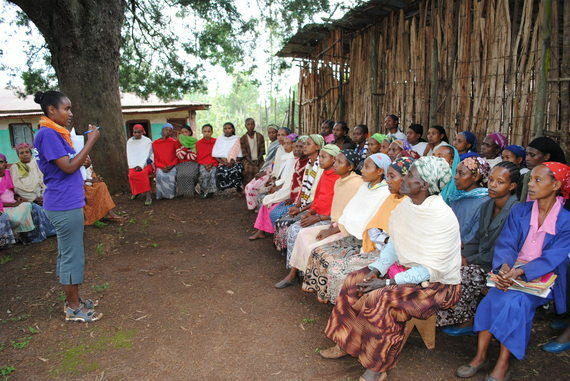 A decade ago, Ethiopia's girls and women faced some of life's most pressing challenges. Cultural traditions resulted in marriage and childbirth among many who had yet to become adults. Access to safe and modern contraceptives was inadequate, preventing many from spacing their births and robbing them of the right to control their bodies. Our largely rural and pastoralist country lacked the necessary infrastructure and skilled health professionals to provide essential services to girls and women. In 2005, our Ministry of Health made it our mission to address these challenges. After all, these were our daughters, our sisters and our mothers. They were the ones who quietly and tirelessly fought to provide for their families despite seemingly insurmountable obstacles. They deserved much, much better. We set out to develop policies - like our Reproductive Health Strategy and Plan for Accelerated and Sustained Development to End Poverty - that respected both girls and women in the present and in future generations. I had always believed that standing with Ethiopia's most vulnerable was simply the right thing to do. Working together with our exceptional leadership team, our Ministry of Health was empowered to make smart investments that could unlock our potential by producing long-lasting health and economic benefits for all. The Ministry of Health started by restructuring Ethiopia's previously male-dominated health system with women at the center. As part of our mission to increase access to health coverage, we recruited and trained 38,000 community health workers--many of whom were women--to provide comprehensive prevention and treatment services using a frontline, peer-to-peer model. Girls and women who distrusted the health system were now able to access high-quality services and information from other women to guide their decision-making. We also built capacity for emergency obstetric care. We strengthened our supply chain systems to ensure contraceptives were consistently available. And we created a surveillance network to monitor and mobilize resources to control infectious diseases, which were claiming the lives of too many women and children. These interventions had a profound impact on the health of our girls and women. Following their widespread implementation, Ethiopia achieved a two-thirds reduction in child mortality, reduced maternal mortality by 69 percent by 2014, and increased contraceptive use from just 8 percent in 2000 to 42 percent in 2014. Our story became evidence that investments in girls and women could produce measurable change. In part, these achievements are why I will have a seat at the table with fellow advocates in Copenhagen this week for the 4th Women Deliver global conference. It is exhilarating to join the chorus of Women Deliver attendees in highlighting the incredible returns society can realize when investments are made in girls and women. Thank you to Jill Sheffield, the founder of Women Deliver, for her vision and dedication. It is truly inspiring to see the vibrant global network that exists today. A network that includes representatives from governments, foundations, educational institutions, and civil society around the world. There's much to share about Ethiopia's success story and I am looking forward to listening to others about their lessons from their respective locations. In looking toward the future of health of societies around the globe, so much is needed if we are to achieve the Sustainable Development Goals. Securing the health and rights of girls and women is a necessary condition if we are to succeed. We need advocates from all branches of government and every corner of civil society to work collaboratively in leading the charge. We must acknowledge the inherent linkages between human rights, gender equity and health. And national governments and global donors must commit to providing equal access to education, health care, employment and representation in political and economic decision-making circles. In 2016, it is abundantly clear that investments in girls and women are the smartest we can make. Both scientific and anecdotal evidence bear out this truth. Simply put, girls and women are the keys that will unlock sustainable development. They are also at the center of the healthier and more resilient societies we desire. The onus is now on us to ignite change by putting them first.